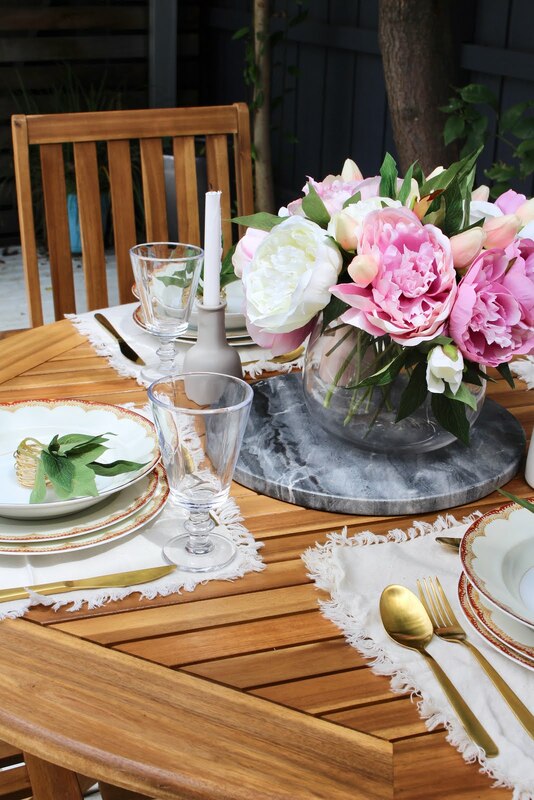 La Maison Jolie: Styling An Elegant Garden Soirée! 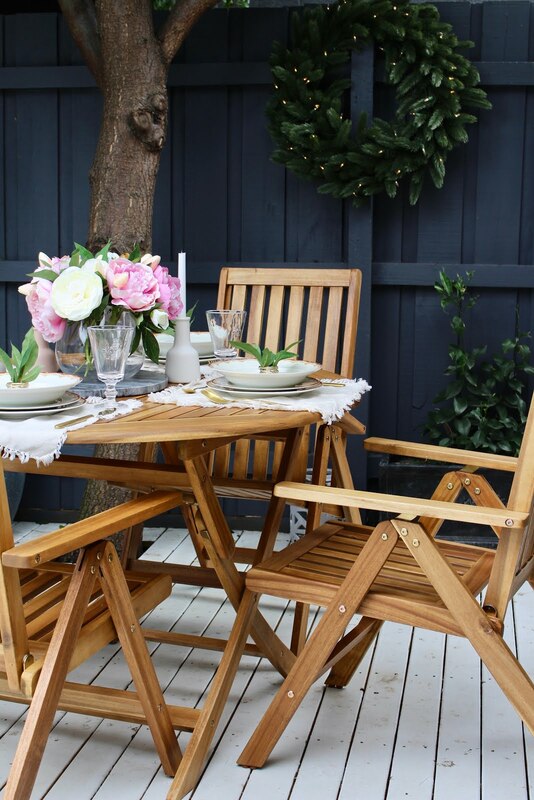 I recently partnered with Temple & Webster to review the beautiful Eivissa acacia 5 piece outdoor dining set and a garden party seemed like the perfect way to do so. 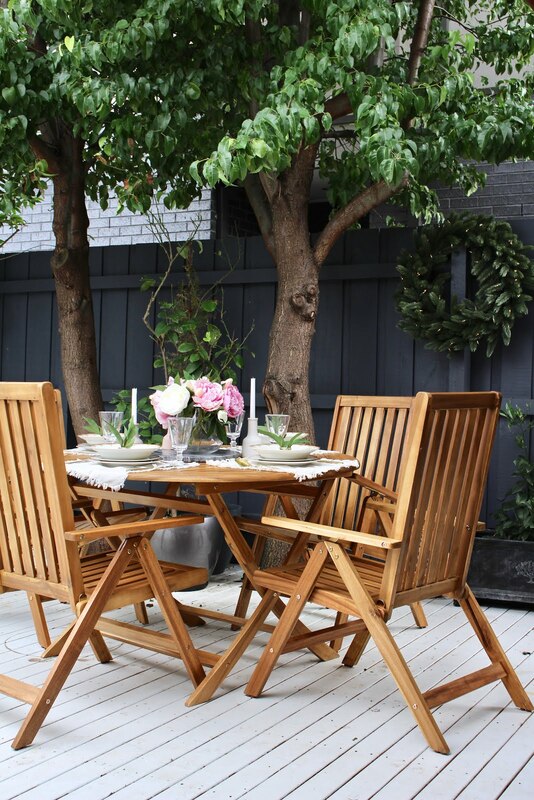 The outdoor furniture set includes a round table and four armchairs all made from sturdy acacia timber. The set arrived flat packed in three boxes and I remember looking at them feeling a tad overwhelmed! But trust me, once you get stuck into it, it's relatively easy to put together. My suggestion- get the chairs out the way first. Once you figure out the instructions and put one chair together, the next three get done like clockwork. The table did take a few extra minutes. The hardest part was figuring out the instructions, especially for a flatpack novice like me. If you've put together IKEA furniture before, you'll breeze through this! 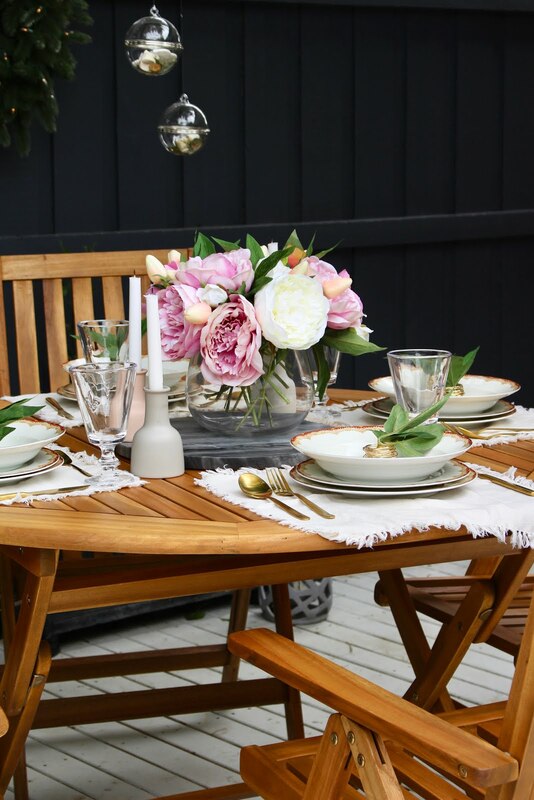 The table and chairs are a smooth light toned wood which is akin to indoor Scandinavian furniture and unlike dark timber or mahogany stained outdoor settings, this colour is versatile and will suit a myriad of backyard landscape designs and colour palettes. 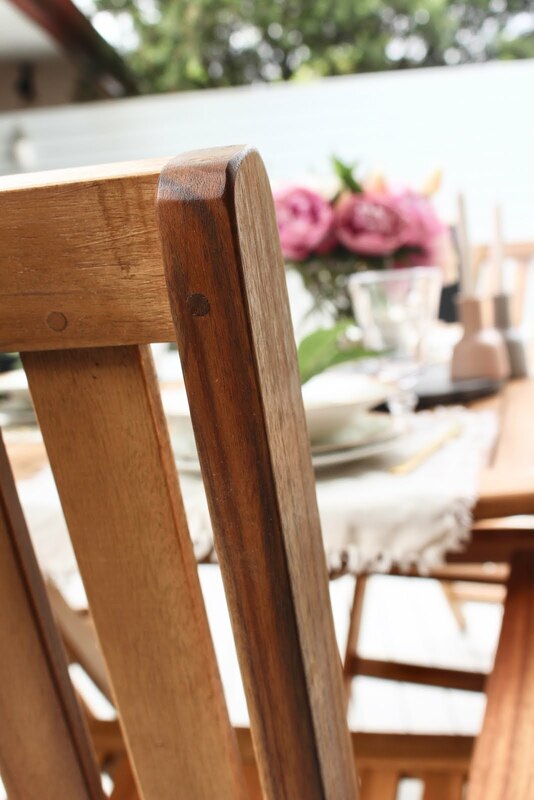 The chairs have soft, rounded edges and of course the table is round which eliminates injury as much as possible when there are little kids running around or playing hide and seek under the table! The table has an umbrella hole. I'm not particularly fond of outdoor umbrellas, however it is an important feature in case your backyard has little or no shade. We're lucky to have two large, beautiful trees that provide us with ample shade. 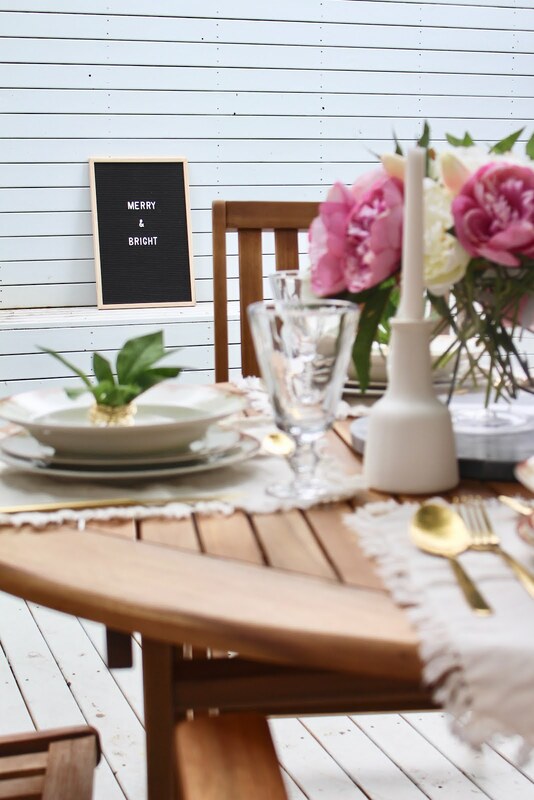 We like to use our deck in many different ways for various purposes like having a picnic or setting up Elie's teepee or when we have play dates, I like to put out all the toys, cars and bikes for the kids to play with and move all the furniture out of the way. 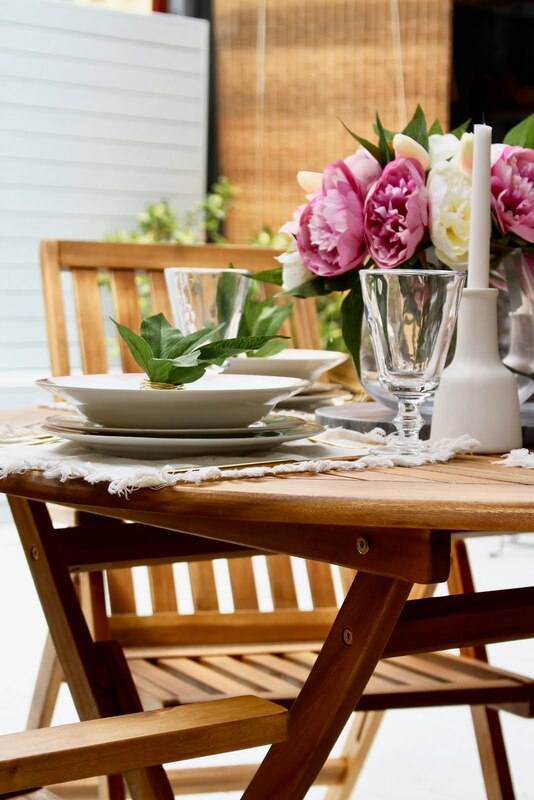 Therefore, I really like the fact that the chairs and the table can be folded flat and stored away in the garage when the deck is being used for other activities. Also it is handy when you're away on holiday and want to securely stow away everything without it taking up much space. Overall, I really like the look of warm toned slatted timber. 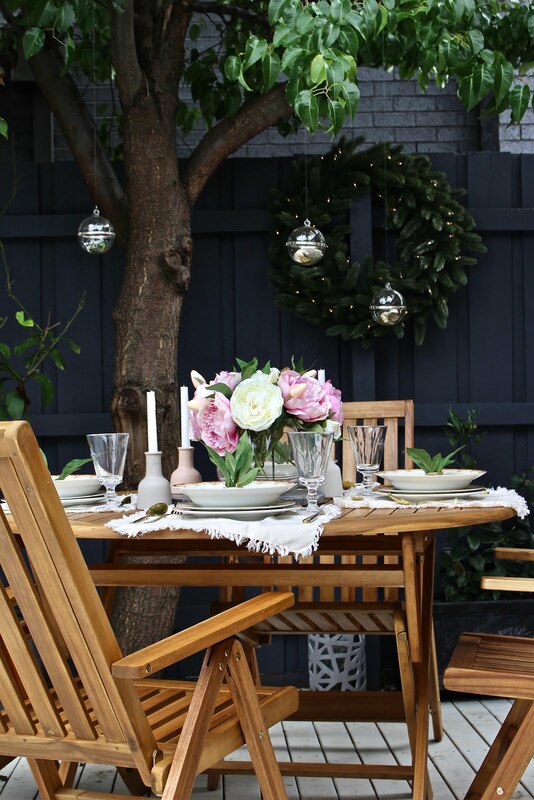 It has a lovely rustic Scandinavian country vibe that is well complemented with the dark grey fence and almost white deck. If yard space is an issue or you're after a small set of outdoor furniture, then seriously look no further than the Eivissa 5 piece outdoor dining set! I took a ton of photos on the day and here are just some of my favourites. 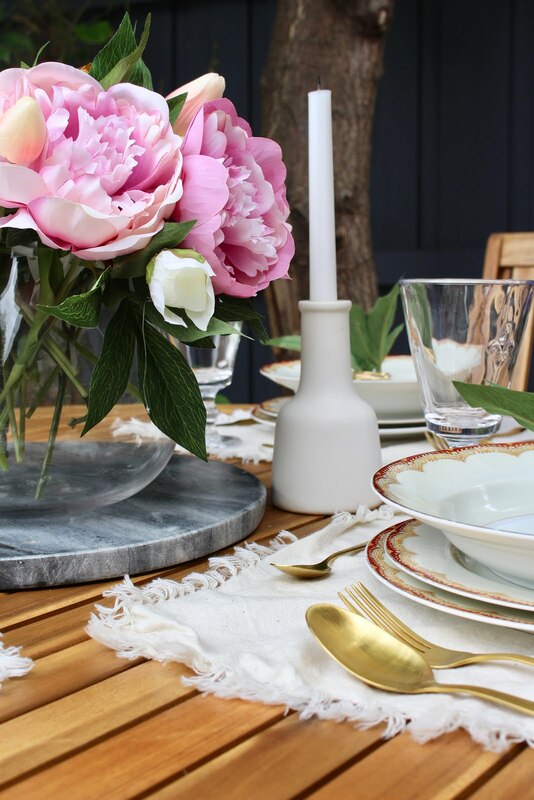 For my garden soirée table styling, I decided on a fresh and pretty, always on trend botanical theme, which is perfect for this time of the year. I dressed the elegant Eivissa timber table with ultra soft neutral linen table mats to complement the pretty red and gold edged vintage crockery, brushed gold cutlery, beautiful fleur de lys drinkware, a bunch of the most gorgeous and realistic looking faux peonies in hues of blush, soft mint green and pearlescent ivory in a pretty round glass vase and pale grey dinner candles! 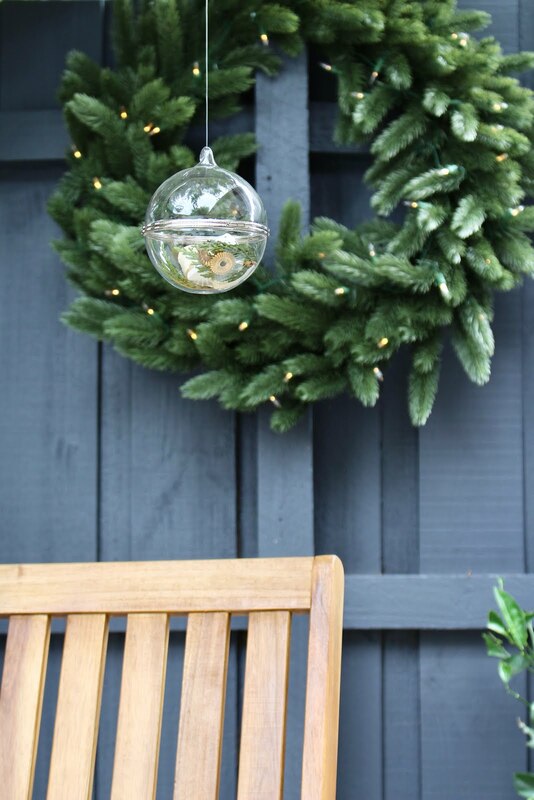 I also hung a pretty Christmas wreath with twinkling LED lights from the fence and fillable glass orbs with transparent fishing line from the branches above to create a magical, almost Alice in Wonderland kind of ambience. The entire set-up, once I was organised, took only fifteen minutes to put together including all the fussing and zhoozhing. Voila! I love how pretty and classy the table looked! 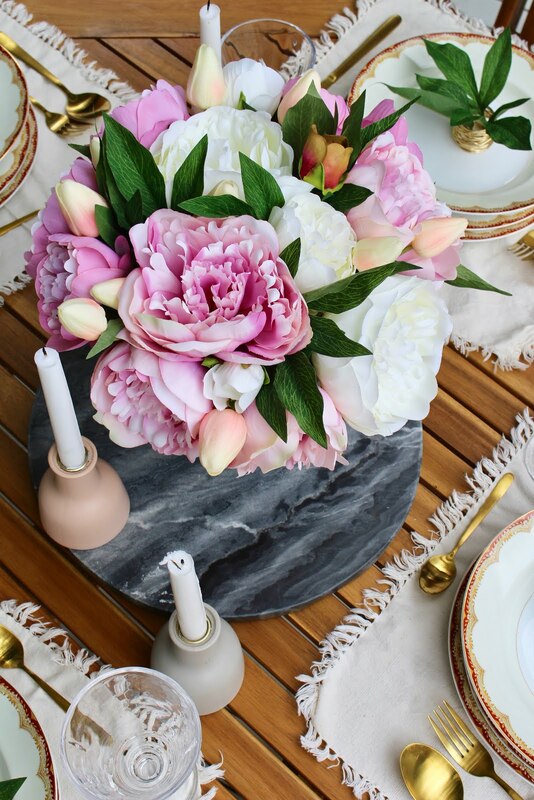 Flowers always make any tablescape look special and sophisticated. 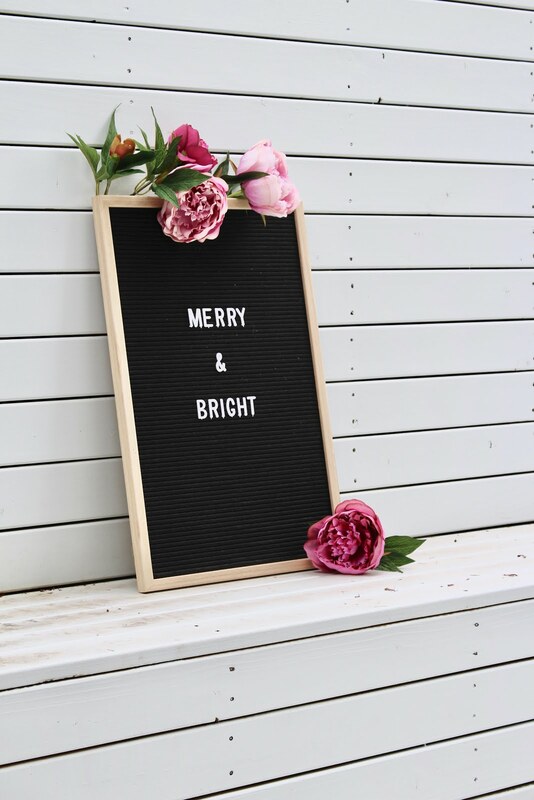 If traditional red and green is not your thing and you are looking for trendy yet affordable styling inspiration for your Christmas Day table, then I urge you to give this fresh, beautiful and luxurious botanical theme a go! You will not regret it! 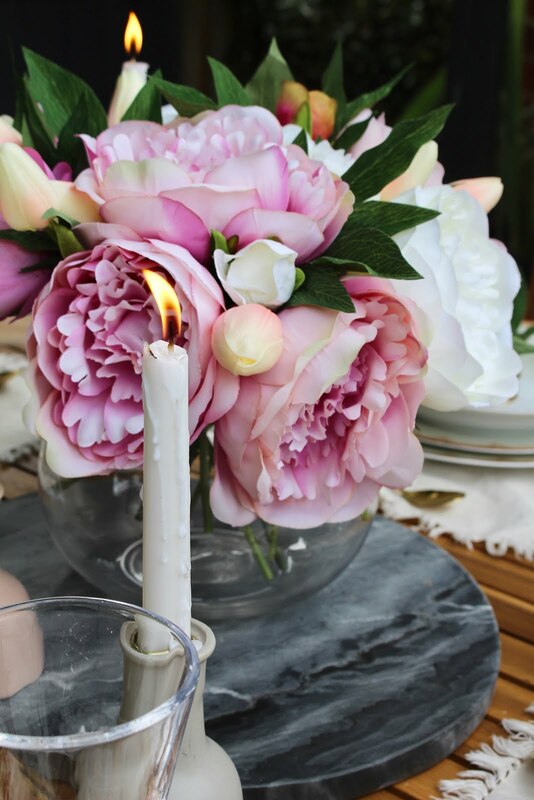 Other than Christmas parties, this sort of floral table styling also works really well with outdoor tween birthday parties, baby showers, bridal kitchen teas or high tea garden soirées. 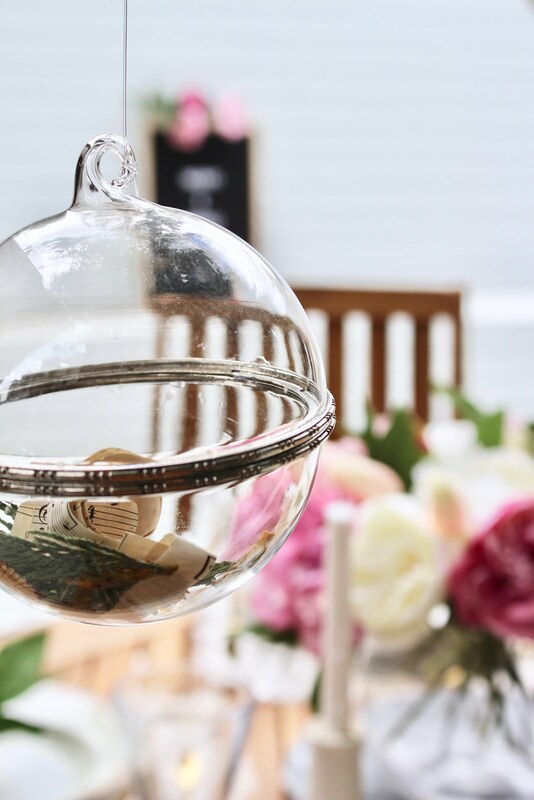 You could also completely skip the fresh or faux flowers and just decorate the table and place settings with sprigs of eucalyptus or gum tree or even olive branches! The organic raw silvery sage colour palette with brushed gold accessories is so hot right now! Needless to say the garden soirée was a huge success and we spent a lovely afternoon filled with food, wine, scintillating conversation and laughter! 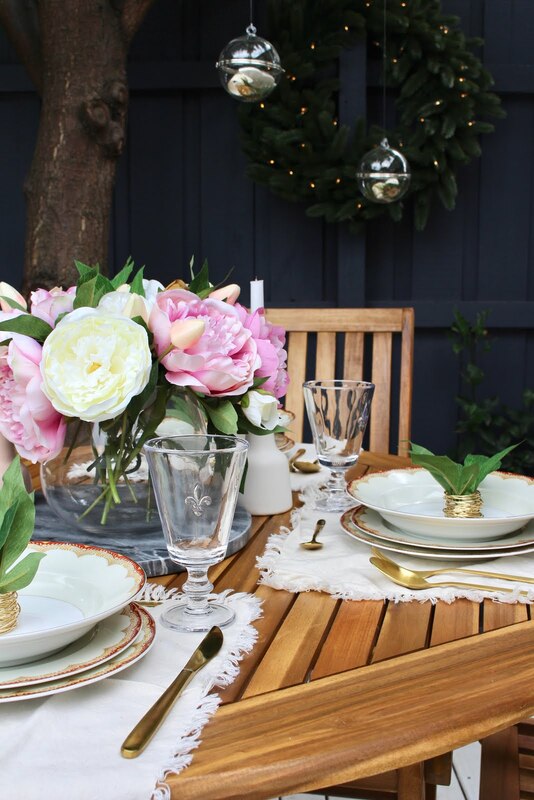 My friends absolutely loved the Eivissa outdoor furniture set, the beautiful floral tablescape, the scrumptious lunch, festive cupcakes and the fabulous company! 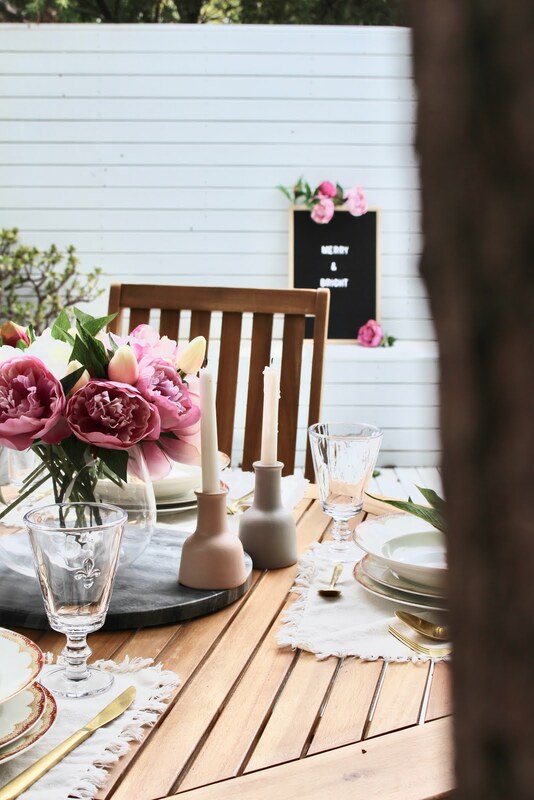 Do you often throw garden parties? 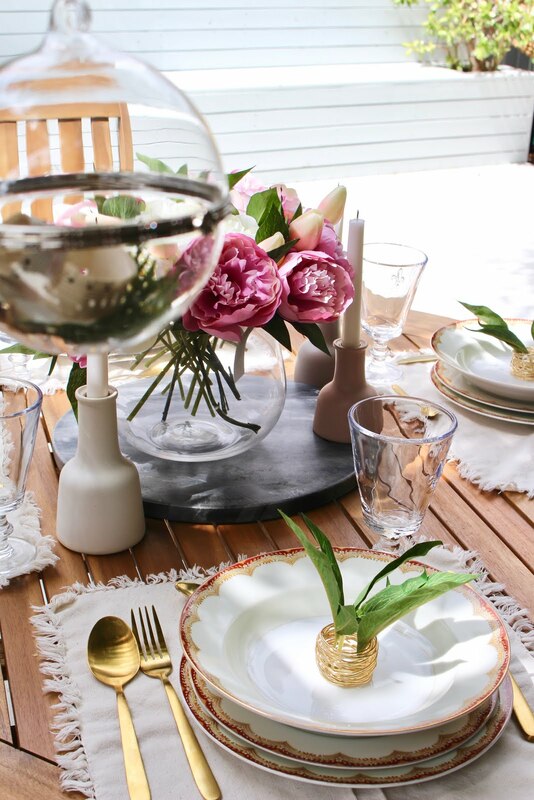 Do you dress the table and decorate the garden? Do share your tips with all of us. 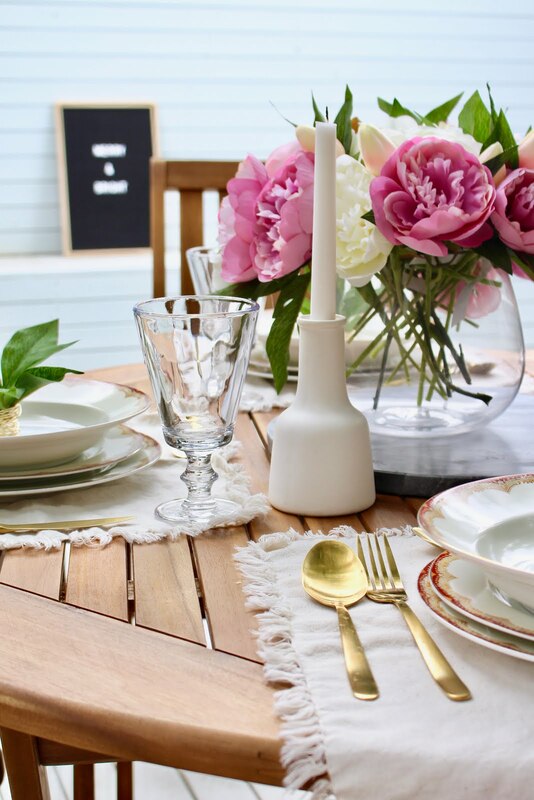 Next time I'll post photos of another simple yet gorgeous themed tablescape that you can set up under fifteen minutes for a fun brunch or dinner with friends. 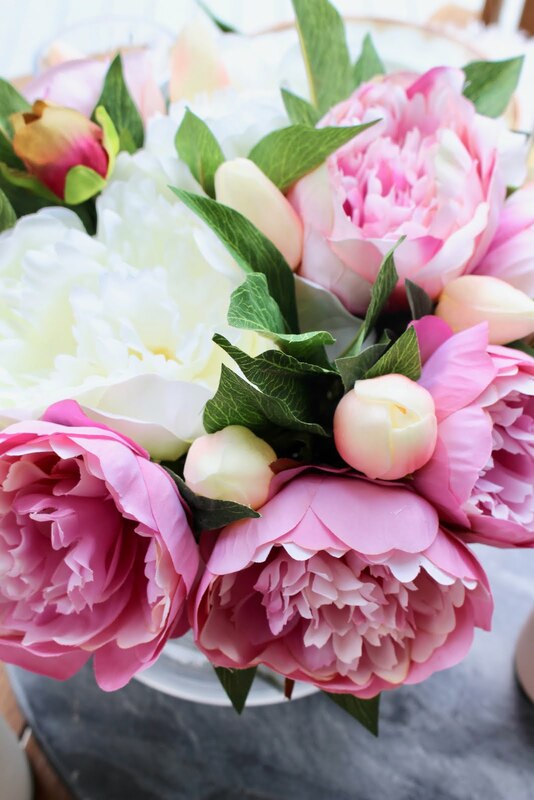 Till next time... hope you're inspired to host a garden soirée! 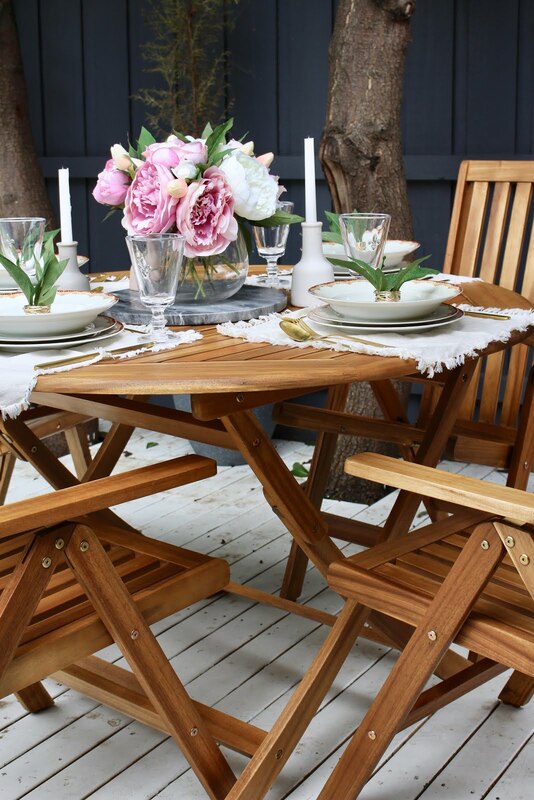 Thank you to Temple & Webster for providing the Eivissa outdoor dining set. As always, all design choices, words, thoughts and opinions are all mine and genuine and I only ever work with brands that I love and I think you will too. 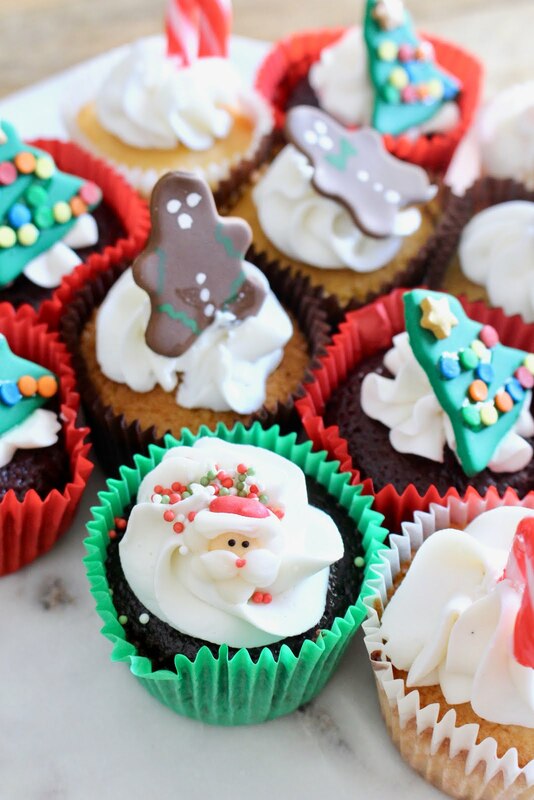 And a huge thank you to all of you for supporting the brands that support this blog!